the trees, bottom right corner. 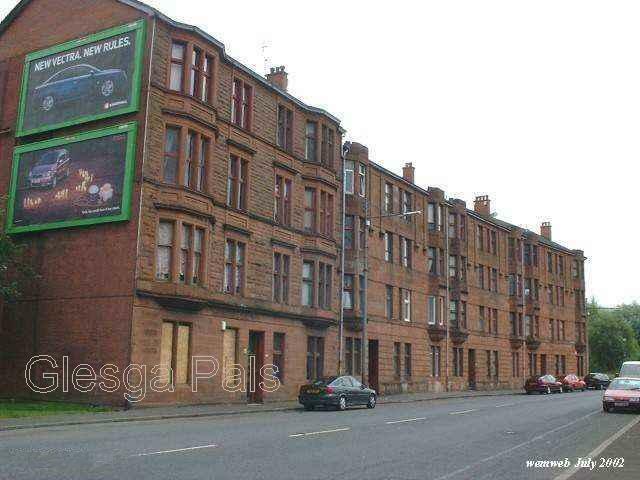 Opposite these tenements is the site of the old Dalmarnock Power Station. 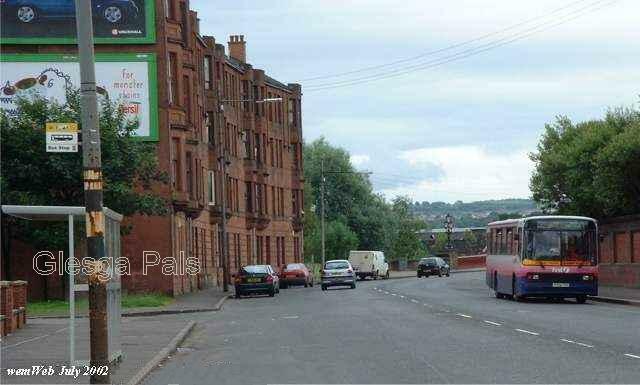 Dalmarnock Road looking towards the Dalmarnock Bridge which can be seen just at the bend. First street on the left, past the bus stop, is Birkwood Street. "I have been looking at your new photographs with some mixed emotions. It is just unbelievable the memories these photographs stir up, and no small amount of excitement just in looking at them. I don't know if you realise just how much pleasure you bring to me and I am sure many others around the world with the work you put into this website." This is a super site and although I haven't stayed in the east end of Glasgow for many a long year, I still meet many of my eastender peers when we meet at Broadwood Stadium Cumbernauld to cheer on our beloved Clyde Football Club. My maternal grandparents stayed at 48 Springfield Road and I have clear memories of "Granny" hingin' out the first floor window waiting to fling me a "piece" when I came out of Springfield Primary School at 4 o'clock. It's interesting that the 811 Dalmarnock Road building ( where I was born) is one of the very few properties which still stand from the original days of Bridgeton and Dalmarnock that I remember.